This time the spotlight will be shining on Goscurry, a racer in which you’ll be trailblazing down a never-ending road, dodging obstacles and racking up points… to a rhythmic beat. Let’s see if we can’t help it escape the cold emptiness of Greenlight limbo. 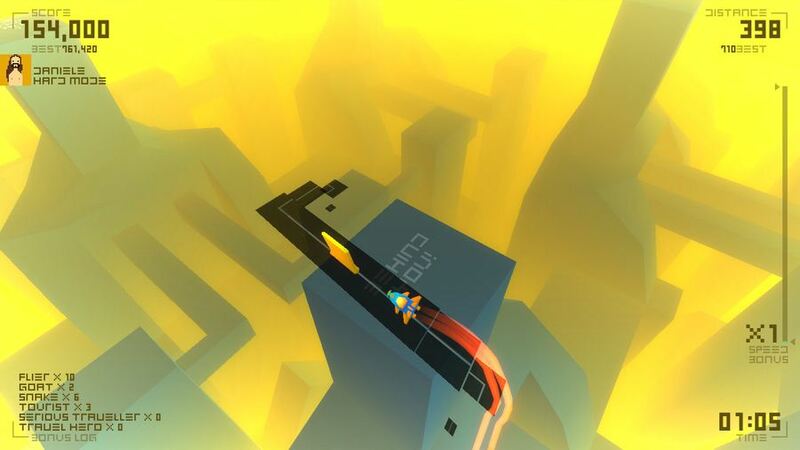 Try to go as far as you can by piloting a ship on an infinite road, suspended over a stylized and eerie landscape shining with electrobeats; while taking sharp corners, evading hazards, surviving speedfreak modes, delivering packages around, fighting bosses (kind of), and unwinding tales. Holy Christmas, that sounds like a hazardous experience – my favorite kind. The amount of obstacles may not be overly varied, but do they really have to be in this kind of fast-paced racer? Not really. Besides, chances are you’ll be going too fast while avoiding collisions and dealing with one 90 degree turn after another, to really care. Oh and it’s all about setting a high score; just like in the good old days! Pulling off sweet moves (or dodging stuff, rather) increases your multiplier, but be careful, as one hit is all it takes to end your run. With no silly ‘rewind’ mechanic or continues and plenty of track across four different modes, the competition’s bound to heat up. Also… that soundtrack! So riddle me this, dear reader: why is Goscurry still struggling to get through Greenlight? It’s been out for a couple of weeks (since December 4 2013), so lack of availability is certainly not the reason. If you haven’t done so already, might I recommend visiting its Greenlight page and handing over a ‘yes’, if you like what you see? Remember: your vote matters! Goscurry is available for Windows, Mac and Linux from the official website, priced at $6 and without any DRM.